The James A. Haley Veterans Hospital in Tampa, FL, is the busiest of four poly-trauma facilities serving the members of our nation's military. The hospital serves veterans of all ages and degrees of injury or illness, including dozens of young soldiers who've returned from the wars in Iraq and Afghanistan with life-altering conditions, such as traumatic brain or spinal cord injuries. If there could be a bright side to their situation, it's that they're recovering in the same city where Jennifer Tracey works and volunteers. Jennifer, a sales representative for Ride-Away (a mobility dealer headquartered in New Hampshire) coordinates an inventive and inspirational program called Vans for Valor, which provides a free wheelchair van to qualifying vets until they can make arrangements for their own accessible vehicle. It's a perfect fit for Jennifer. Her father, brother, and son are all members of the military, and she volunteers 15 or more hours a week at the veteran's hospital and neighboring Fisher House, a "home away from home" for families of acutely hospitalized patients. "It's a great partnership," explains Jennifer. "We're able to provide a service they deserve, and at the same time build a relationship with them." Here's how Vans for Valor works: a consultant meets with the veteran to determine what type of handicap van would best meet his or her needs. Later the modified van is delivered by Ride-Away to the vet's home. The family can use the mobility van free of charge - Ride-Away pays for the maintenance, insurance, registration and adaptive equipment costs - essentially a free wheelchair van - until they're "ready to roll" with their own adaptive vehicle. In fact, the only financial responsibility the veteran has is to pay for fuel. Through Jennifer's dedication, Vans for Valor has been very successful and continues to provide an exceptional service to our veterans, an (unfortunately) often overlooked and under appreciated segment of the wheel chair van market. Currently three Entervan wheelchair accessible minivans are on-loan through the program, and dozens of vehicles have been purchased by veterans in the past year alone. Word-of-mouth advertising is increasing the program's popularity. "When a patient with a disability is admitted to the hospital, the others are always telling him or her, "You've got to meet Jennifer from Ride-Away!'" she says. Jennifer's enthusiasm for supporting our veterans, through her work and volunteer efforts, is contagious. One phone conversation with her had me reflecting on how often I take our military and their efforts for granted. 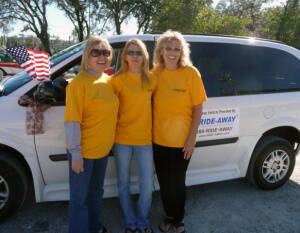 She is especially excited that Ride-Away will co-sponsor a float with BraunAbility at the 2009 National Memorial Day Parade in Washington D.C., which is held each year on Memorial Day. This year's event will include General Colin Powel, General Michael Mullen, Joe Mantegna, Gary Sinise, and of course, retired and active duty military heroes. With the Memorial Day holiday just a few days away, BraunAbility would like to extend our sincere appreciation to all of our veterans and to the volunteers like Jennifer Tracey who make sure they're recognized.